A portion of the blog post here previously may be published as content in my Milwaukee Brewers historical book. For this reason the post has been taken down. This page remains in place so links posted to here on various social media sites remain active. Details on the book publisher and a release date will be posted here in 2017. Thank you for your patience! 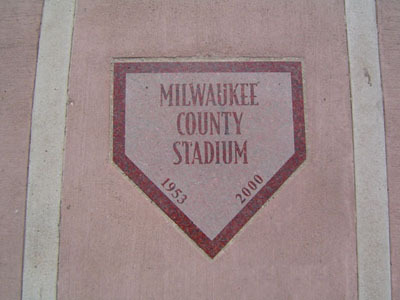 County Stadium’s home plate is marked in the third base walkway/concourse of Helfaer Field.